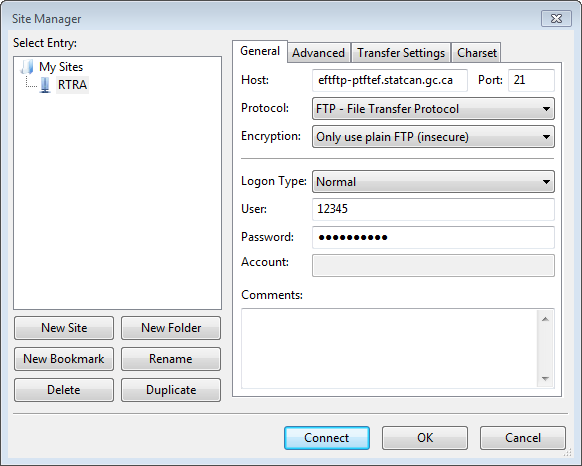 Step 1: To access survey metadata, users should download FileZilla, a free file transfer platform available at http://filezilla-project.org/ . Follow the provider’s instructions on how to download this application. Step 2: Once you have FileZilla installed, open the application. On the site manager pane, click new site. Under the “select entry:” window, you can rename your new site to “RTRA”. You are now ready to connect. Click the Connect button on the Site Manager pane. Step 3: Once you have connected, your FTP account should appear. You may now navigate the RTRA resources and metadata under the Remote Site pane, located to your right. If you have any questions or difficulty in setting up your FTP account, please contact an RTRA agent at: statcan.madrtra-damadtr.statcan@canada.ca.